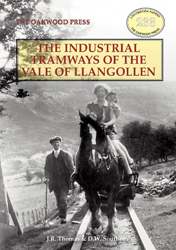 This book began some ten years ago when J.R. Thomas was given a series of short articles about minor industrial tramways in and around Llangollen. Wanting to find out more about what seemed to be some old and obscure tramways, all in close proximity, he began to try and record the different lines and their workings. He researched local records and papers, and best of all, walked all the remaining sites making notes as he went. There have been a number of excellent articles published, in particular within the Debigh Historical Society papers, the Glyndyfrdwy Women’s Institute and at least one college thesis involving the Oernant workings. As for the other sites there was very little of detail. Equally there were precious few photographs of the systems in their everyday working. This was due to the fact that many of the very early plateways and tramways had gone by the time photography had developed and been made portable enough to reach these upland, remote areas. Again, some systems lasted only for a short period not even being recorded between successive visits by the Ordnance Survey recorder. Fortunately for the researcher, some of the systems here within did continue operating without modernisation right up to closure, one of which lased until 1954. In some areas all has been swept away. That makes it near impossible to trace. Others lie in private property, but, in some places the trackbed has been thoughtfully retained as footpaths which lead the inquisitive walker on an adventure into some of the most remote and beautiful areas of the country.